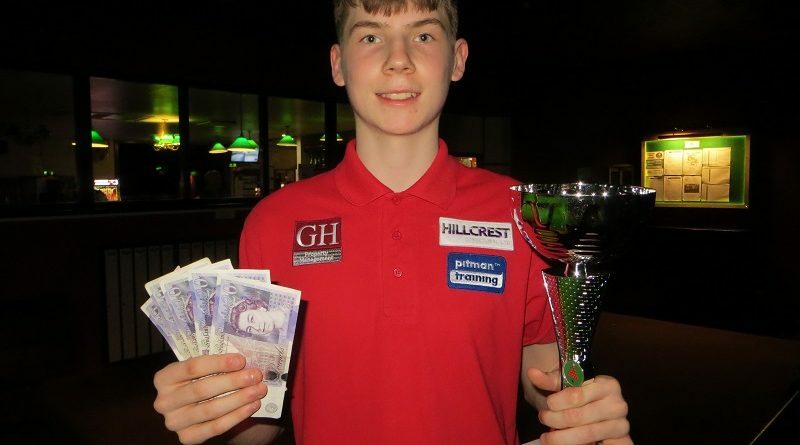 The 17-year-old from Eastleigh pocketed £100 towards more driving lessons after beating Bradley Cowdroy 2-0 in the final of the event sponsored by TopCue. And he is now back in contention to win the rankings title. The previous day, Benzey lost 4-0 to Andy Symons (Tavistock, Devon), the eventual tournament winner, in the last-16 of the West of England Billiards & Snooker Foundation’s Gold Masters in Weston-super-Mare. Plans for a day off were shelved, though, in a late-night decision. It was actually a long weekend for both finalists. Cowdroy (Bournemouth) was beaten 3-0 by Alex Clenshaw (Harlow) in the final of an under-18 event run by snookerfans.co.uk in Dunstable the previous evening. Group-stage casualty Oliver Sykes (Chandler’s Ford) takes a four-point lead over Cowdroy into the final event. Benzey is eight points further back in third. Londoner Ronnie Sullivan overcame Cowdroy 2-0 in his first match and finished the group stages unbeaten before going out 2-0 to Benzey in the last-four. In the second semi, Callum Browne (Trowbridge), who won the British universities and colleges individual championship in Derby last month, made his first Cuestars appearance of the season and lost 2-1 to Cowdroy in what can only be described as an epic. Chandlers Ford SC hosts the tenth and final leg on Sunday, May 5. ROUND-ROBIN GROUP A: 1st, Callum Browne (Player’s, Westbury); 2nd, Connor Benzey (Chandlers Ford SC); 3rd, Jamie Wilson (Waterlooville Sports Bar); 4th, Oliver Sykes (Chandlers Ford SC); 5th, Dan Sykes (Chandlers Ford SC). ROUND-ROBIN GROUP B: 1st, Ronnie Sullivan (Frames, Coulsdon); 2nd, Bradley Cowdroy (Greenbaize, Bournemouth); 3rd, Ryan Hughes (Chandlers Ford SC); 4th, Steven Hughes (Chandlers Ford SC); 5th, Chloe White (Waterlooville Sports Bar). SEMI-FINALS (15 points): Cowdroy 2-1 Browne, Benzey 2-0 Sullivan. FINAL (£100/£25, 25/18 points): Benzey 2-0 Cowdroy.